I'm starting a vegetable garden this spring. I don't know what took me so long to start one...but it's never to late. My neighbor started one last year and she did a great job for her first time. She inspired me to start my own garden. I wanted to create a unique border for it. 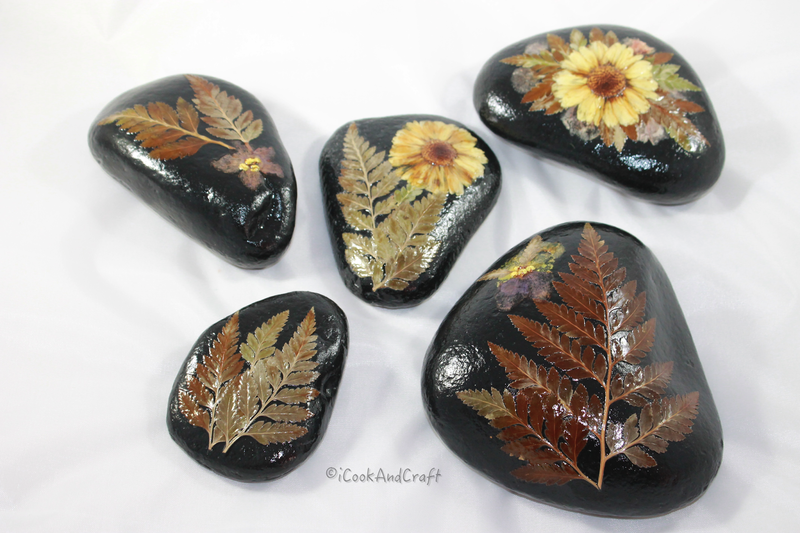 I found these rocks and after looking at them for days I thought ...Nah too plain. 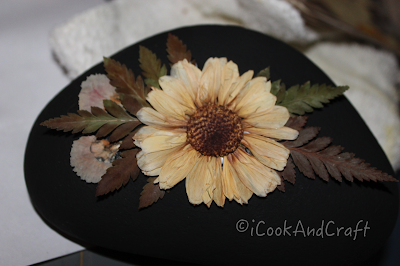 So I thought why not put to good use all these pressed flowers and leaves that I have. 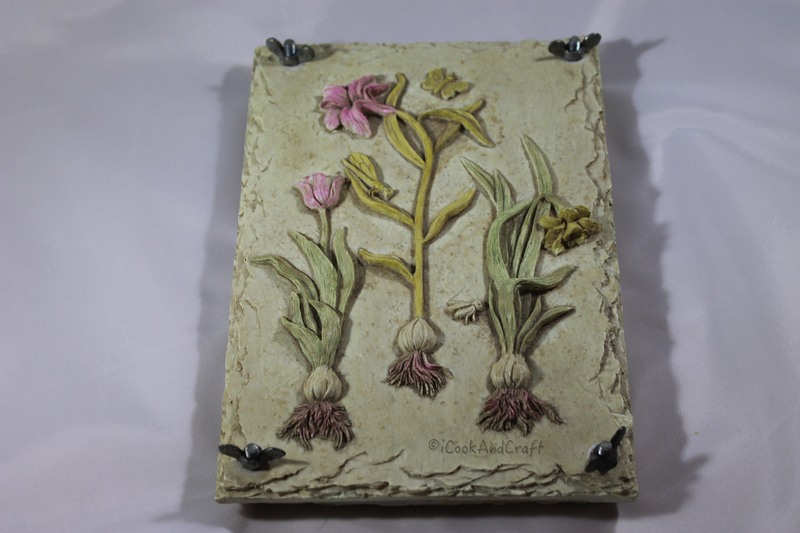 I have this great flower press that I bought years ago made of heavy slate (can't remember where I got it) and every summer I collect and press various leaves and flowers that I find. I started by washing and scrubbing the rocks. Then painting the rocks black. I just used regular acrylic flat black paint. 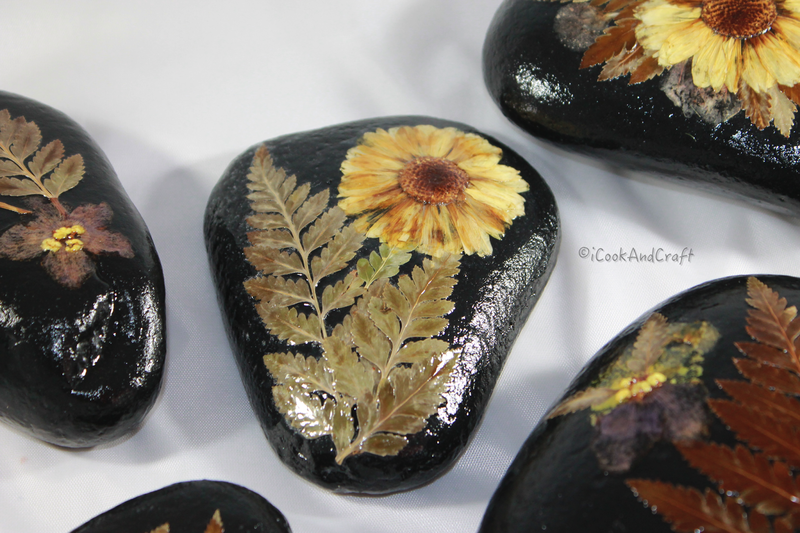 Then I carefully glued flowers and leaves on the rocks. 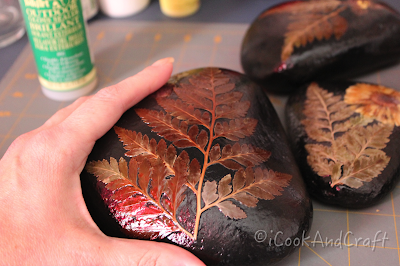 I used a spray glue by Elmers on the underside of the leaves to stick them to the rock. 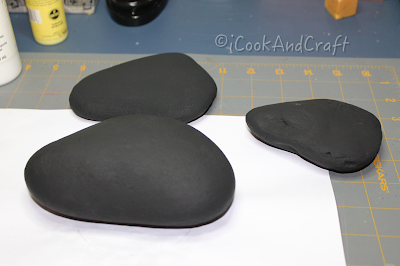 Then added another craft glue to make sure they were really secured. 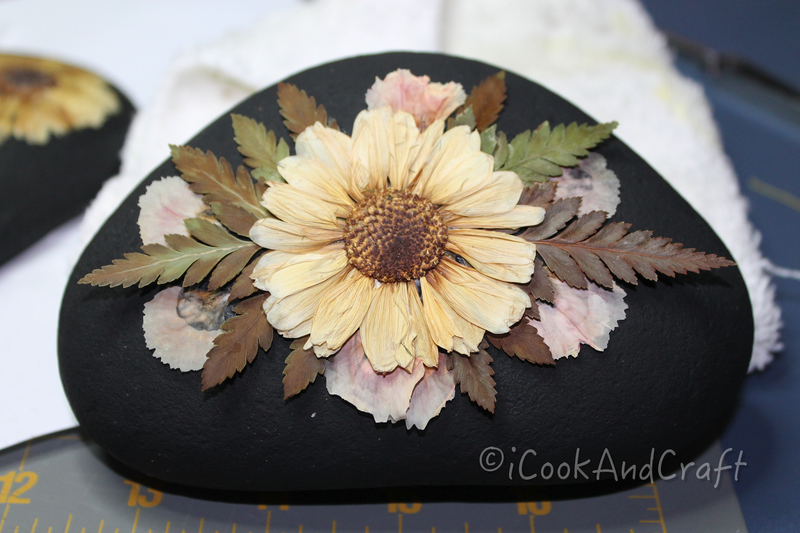 I just kept adding leaves and flowers until I got the look I wanted. I made sure to put plenty of glue, let it dry a for about a 1/2 hour and then placed the rock upside down on wax paper over a thick towel to make sure it flattened all the leaves onto the rock. Don't forget to use wax paper so it doesn't stick. I let the glue dry for a few hours. Then painted a clear outdoor seal . I started by painting the underside of the rock first with two coats. 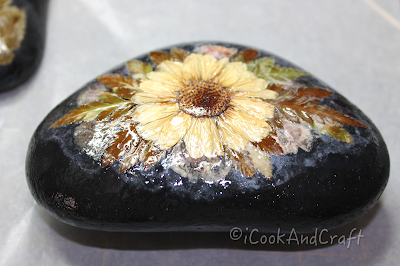 After I let it dry overnight I painted the seal over the flowers. I used a gloss outdoor sealer . Don't worry about the white film you might get under the sealant when you first paint it. That's from the glue. Once it's completely dry it will go away. 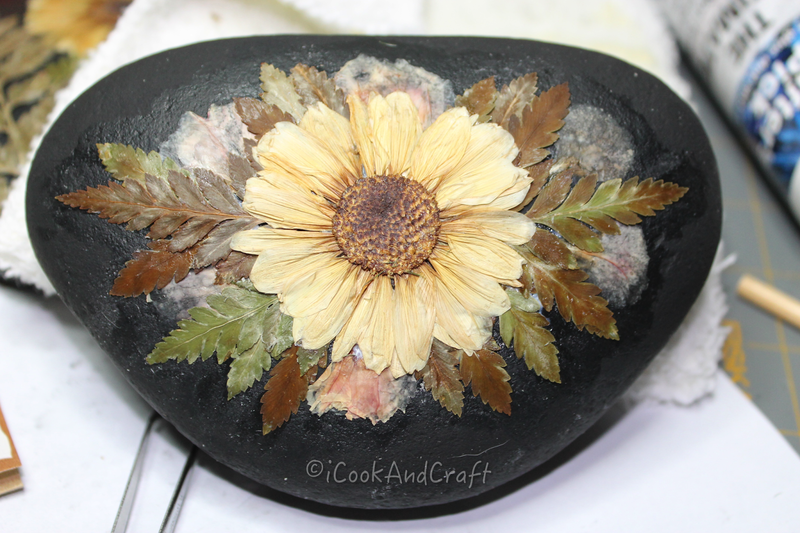 I put 2 coats under the rock and about 3 on top. And here they are all done! I LOVE IT! I've made quite a few of them to add to my garden border and I'm still working on some more. I plan on using some for my outdoor patio table too. I thought they'd be great for keeping napkins and paper plates from flying away when we eat outside. Just saw these on yr blog (was looking for the cake release recipe, when "low & behold"). Great idea * they are gorgeous. Those are absolutely beautiful. You are one talented woman. I enjoy your cooking video's for a couple of years now. You and your man are a pleasure to listen too.